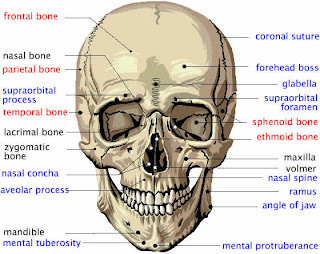 Right click on the above diagram to enlarge it in another browser tab so that you can switch between tabs to identify the bones to which I refer. If that doesn't produce the enlargement, then right click HERE and open in new tab. Also use the palm of hand, which is thicker, fleshier, than the fingers. To protect upper teeth use palm of hand to 1) From top to Down - cover entire upper jaw, including lower ocular (eye) bone ridge downwards to cover the mallar and maxilar bones as well as roots of teeth, while at the same time covering 2) from jaw hinge to nasal concha bone (nose ridge). If the very front upper teeth still hurt, use palm of other hand (or shift original hand) to cover the nasal spine, aveolar process and front teeth. To protect lower teeth use palm of hand to 1) cover mandible (lower jaw) from the hinge/joint towards the front teeth, making sure to cover the entire jaw line, including teeth roots. If the very front lower teeth still hurt, shift hand (or use other hand) to cover the the mental tuberosity, mental protuberance and roots of front teeth.